Lisbon is brimming with events throughout the year, but in early June, the city is jam-packed with festivities which represent the heart of the EGEAC sponsored Festas de Lisboa (Parties of Lisbon). Starting on the 15th of May, the Iberian Masquerade Show kicks off the citywide party with loud expositions, various musical concerts, and interesting cultural events such as Theatre in the metro and Fado on the trolleys. 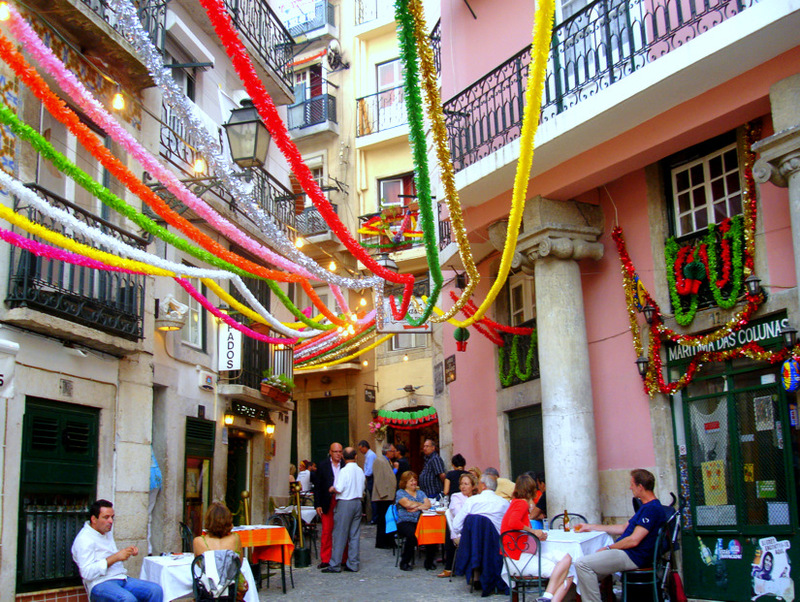 But the most extravagant and outrageous summer events are the Festas dos Santos Populares (Popular Saints Parties); a mix of traditional pagan celebrations honoring the summer solstice and the religious feast days of Santos Antonio, João and Pedro (Saints Anthony of Padua, John, and Peter). And of these three, may I suggest you make your way directly to Santo Antonio, the native-born patron saint of Lisbon, who on June 12th and 13th kicks up a party like you’ve never experienced in your life! Born in Lisbon in 1195 as Fernando Martins de Bulhões, the son of a very rich noble family, Saint Anthony went against his parent’s wishes when he decided to enter the Augustinian Abbey of St. Vincent where he studied Scripture and Latin Classics. Ordained a priest, he later went on to preach the Gospel with a group of Franciscan friars throughout Morocco when a detour in Italy led him to be highly praised for his sermons and teachings of the Gospel all throughout the Mediterranean. Today, Saint Anthony is known as the keeper of lost things, but in Portugal (and Brazil), he is known as the marriage saint, believed that he conciliated couples during his time. So every year in Lisbon, since the late 1950’s, a lucky group of “modest” young couples receive the blessing of Saint Anthony when married on June 13th in one large wedding ceremony called, the “Santo Casamenteiro”, at the historical Sé Cathedral in the antique Alfama neighborhood. The tradition of the Santo Casamenteiro also correlates with another tradition for couples and Lisboners looking for love, with the gift of Manjerico to that special someone. These little-potted plants of newly sprouted Basil (for a newly sprouted love) are crafted into the form a ball (looks like a Chia pet actually) and are given as gifts during the month of June. Colorful paper-mache flowers are placed into pots alongside one of the many popular verses recited about manjerico. O amor fica a esperar. (Is) Love that is wanted to be given to you. And of course, the manjerico plants have a wonderful aroma, but it is customary to rub the leaves in between your fingers before you swoon from its fresh peppery green aroma. The evening begins at approximately 9:30pm with the Marchas Populares parade, which starts at the top of the Marques de Pombal square and flows down the main street of Avenida da Liberdade where they end in Rossio Plaza. These very colorful and glitzy folk marches have been occurring since the 18th century, but during the beginning of Portugal’s reign of dictatorship in the 1930’s, the government decided to use the festivities to express their poor, frugal lifestyle of tradition and nationalism. Thus in 1932 began the competitions between Lisbon neighborhoods to win the award for the best march, and they’re just as fiercely competitive today, planning and rehearsing many months in advance during which they choose a new theme for their costumes and displays each year. The marches are broadcasted live on TV, and this year, the competition was so fierce that the losing neighborhood hit the streets the following day in costume, claiming the judging was unfair! Historically, people ate foods associated with poverty, which meant pork and sardines. Sardine’s popularity was as a result of not only Santo Antonio’s legendary “sermon to the fish” in Padua – eventually renowned as the patron saint of fishermen, but also because it is the high season for sardines. The cut of pork traditionally used is called entremeada, and is considered the fattiest and poorest cut of ribs you’ll get your hands on. Both the pork and sardines are grilled outside and can be savored just about anywhere in Lisbon, slapped on a bun (referred to as Sardinha no Pão and Entremeada no Pão) and consumed with sangria or beer, which flows like water on Santo Antonio. Of the several downtown neighborhoods that have huge participation on the Eve of Santo Antonio, Alfama has always been the most popular! Annually, its decorations are the said to be the most extravagant, their food and drink stands the most abundant, and their music concerts the most plentiful. By midnight on Santo Antonio, as the Marchas Populares are wrapping up, the streets of downtown Lisbon become so full that one literally cannot pass from one side of the street to the other. The noise from the concerts and fans singing with gusto can be heard even on the outskirts of the city, while the ground is layered in plastic cups, beer cans, decorations and odds, and ends. Yet miraculously, the bleary-eyed and happy partygoers make it until the end of the night without any debauchery to watch spectacular fireworks display down by the river. The Santo Antonio party is definitely a wild one, but with all of its historical and very colorful traditions, it would be a shame to miss such a unique event in Portugal. So mark your calendar for June 13th and look on www.egeac.pt for more information on upcoming events this summer during Festas de Lisboa. Contact Catavino to book an unforgettable Portuguese experience!